Greetings, friends! I am happy that we have now arrived at the month of March, and hopefully some milder weather. I would like to forget about February entirely! Today at Stamp Ink Paper, Justin has a fun challenge for us: to use wood, cork or felt on your card. I have loads of little wooden elements and never touch a one of them, so this was a good challenge for me! After way too much deliberating, I settled on some wooden snowflake elements from Lawn Fawn. I'm pretty happy with the way my card came out, and I even got to use up some odds and ends I had left over from other projects. I like the mellow earthy colors too, a nice change from the bright reds and greens of Christmas. 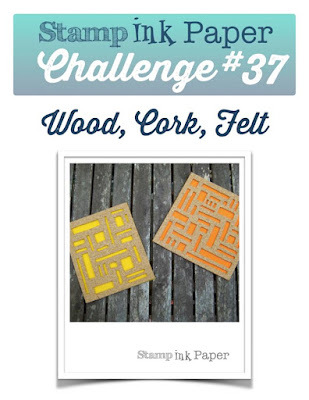 This is the last day to play along with the 30 Day Coloring Challenge at The DailyMarker, and I'm also playing along with Anything Goes at the Simon Says Stamp Wednesday Challenge. I am with you on February! Rip that page off the calendar! Love your little scene here...a fun challenge for sure, and your coloring is CUTE! Gorgeous card Sandy! It's so cute and I love the scene you've created.